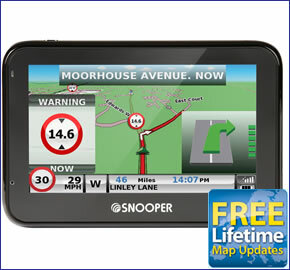 Snooper Syrius Pro S2700 car sat nav includes a 4.3-inch slim wide touchscreen. The Syrius S2700 also provides TMC Traffic information. Snooper S2700 Syrius features Lane Guidance and Junction View to help guide you along your route with turn-by-turn voice directions. The S2700 Syrius Pro also has My Speed and My Speed XL speed limit alerts for every road and optional speed cameras. The S2700 is preloaded with European maps which are free to update for the lifetime of the product. Snooper S2700 Syrius Pro Europe has been discontinued. Accessories, spares and parts are still available for your S2700 Syrius. 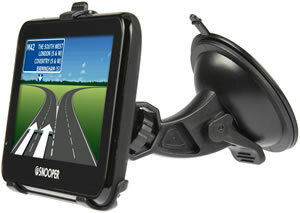 The Snooper Pro 2700 satnav has a 4.3 inch LCD widescreen for easy to view directions to your destination. The Snooper 2700 comes preloaded with UK and European mapping. Furthermore the Snooper 2700 can optionally feature Snooper's award winning AURA speed camera database. The mapping used with the Snooper 2700 are the latest Here Maps and this Snooper satnav comes with Free lifetime map updates so you will never need to pay to update the mapping in the device. ‣Snooper S2700 Bus & Coach - for drivers of coaches and buses. ‣Snooper S2700 Truckmate - for drivers of trucks, HGV's and oversized vans. ‣Snooper S2700 Ventura - for drivers towing caravans or driving a motorhome, or large camper vans. ‣Snooper S2700 Syrius - for drivers of cars and small vans. Please note: All of the above Snooper S2700 models feature a car mode. S2700 car sat nav also provides advanced warnings to roadwork's, congestion and traffic jams and what's more these alerts are all FREE. The S2700 Pro features TMC Traffic information which utilises the traffic master information network. SPECIAL OFFER: Buy the S2700 Syrius Pro Snooper car sat nav model from ActiveGPS and receive FREE lifetime map updates worth over £100. The annual road map updates are by here. To view details of the offer and other models that include the FREE lifetime map updates click here. Snooper Syrius S2700 sat nav calculates your route for your car and it will provide turn-by-turn spoken navigation to your destination. 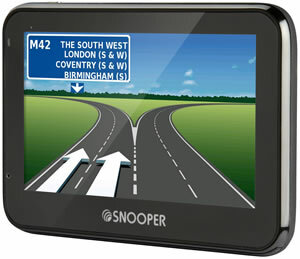 The Snooper Syrius S2700 Pro satnav also features Junction View and Lane Guidance. These two features help to make it clear which lane you need to be in at each junction providing you with plenty of warning. If you would like to travel on certain roads along your journey, the Snooper S2700 allows you to include these roads for your route. Simply enter the particular roads in the 'Your route" feature. The Snooper S2700 also has multi-route technology. Just enter postcodes, points or interest or favourites and the Snooper will provide you with a journey stopping off at each location. If you want the shortest route between multiple stops simply press a button and the Snooper will rearrange the destinations in the most cost-effective order. The Snooper S2700 has a point of interest (POI) 'corridor' search which will inform you of points of interest along your predetermined route. Additionally the Syrius S2700 sat nav system includes petrol stations POI so you can find the nearest one to you or in a pre-defined area. There is also a route timer that can be set to alert you when it is time to take a break on your journey so that you do not risk falling asleep whilst driving long journeys. Snooper S2700 Syrius also includes a feature called MY SPEED. This feature provides speed limits for all roads in the UK and Europe* and is displayed in the bottom left hand corner of the sat nav navigation screen. You can select speed limits for cars or larger vehicles. Plus you can set the system to alert you if you are driving above the speed limit. In addition, My Speed XL is a feature that shows the road speed limit in a large format on screen rather than the satnav map with directions. So if you know where you are driving to and do not need directions then you can view the My Speed XL feature instead and know every speed limit of nearly every road. Optional speed camera locations - it is also possible to receive alerts to fixed and mobile speed camera locations via the subscription based Snoopers AURA speed camera database. When downloaded to the Snooper S2700 Syrius, the GPS driven database will warn to speed cameras across the UK and Europe*. *Please note: European speed camera locations will only be displayed if you buy the European S2700 Syrius sat nav version. Do you have a question about the Snooper S2700 Syrius that's not been answered on this webpage? Please see our car sat nav FAQs for questions from other customers and visitors. Plus if the answer to your question isn't featured, use the online form to ask us for the answer. Alternatively please telephone 01733 777623 Monday to Friday (9:30am-5:00pm) to speak to one of our sales team. We do not recommend using a third party charger with this product. A mobile phone USB charger or a laptop may not be powerful enough to reliably charge the Snooper S2700 Syrius Pro and may provide an incorrect voltage or insufficient power. An official genuine Snooper AC charger is available for indoor use with this product you can view and buy here. Snooper S2700 Syrius Pro provides advanced warning of all fixed speed cameras, SPECS and many laser sites using Snooper's AURA speed trap database. There are 3 easy ways to pay using a credit or debit card. The Snooper S2700 will only operate on Windows computers. Specifically, you must be using, Windows Vista, Windows 7, Windows 8 or Windows 10. Additionally the software will only work with Internet Explorer 8 or Firefox 10 or above. Please note: The Snooper S2700 is not compatible with and will not operate when using earlier Windows or Apple Macintosh operating systems. The Snooper S2700 Syrius comes supplied with everything you need to use it in your car (see What's in the box? above), however replacement and additional S2700 accessories are also available to buy from ActiveGPS. Parts available include: hardwire power cable, windscreen suction cup mount, AC mains charger and vehicle charger.